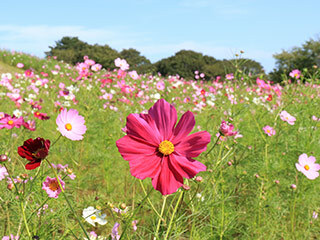 Cosmos at Hitachi Kaihin Park (ひたち海浜公園のコスモス) is one of the cosmos spots around Kanto. Hitachi Kaihin Park is a large park located in Hitachinaka, Ibaraki Prefecture. Cosmos bloom from the end of September to the middle of October. At the same time, Mexican Firebush and Soba Flowres bloom and creat the great colorful hills. Admission: 410 Yen for Adult, 210 Yen for senior, 80 Yen for kids. There is a group discount. 1. use JR Joban Line to Katuta station. 2. use local bus to Hitachinaka Kaihinkoen. Hitachi Seaside Park is one of the large flower park in Ibaraki. There are many seasonable flowers. Baby blue eyes in April is very famous in the world. Tulips and Linaria are blooming in late May.